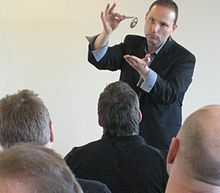 Guy Bavli (Hebrew: גיא בבלי‎; born 1971) is an Israeli mentalist, illusionist, and lecturer. He is known for being the first Israeli citizen to win an international magic competition in the United States. He owns the entertainment company "Master of the Mind", based in Fort Lauderdale, Florida. Guy Bavli was born in Tel Aviv, Israel in 1971. He served in the Israel Defense Forces for three years, when he developed a mind reading act and became a member of the Israeli Air Force Performing Group as an actor and singer, In 2002, he moved from Israel to the United States. Bavli became interested in mentalism and illusions as a source of solace from the divorce of his parents and childhood obesity. He was particularly influenced by Uri Geller, Charlie Chaplin, and Roni Shachnaey. Bavli began performing before audiences at five years of age. When he was eight years old he had his first professional performance at a swimming club in Tel Aviv. In 1996, Guy successfully predicted the outcome of the 1996 Israeli general election on the prime time live television show in Israel, two weeks before the election took place. His predictions were put inside an envelope, which was sealed and signed by the television host Dan Shilon, Mayor of Tel Aviv Roni Milo, and former Mayor of Jerusalem Teddy Kollek. Afterwards, the envelope was locked inside the steel safe until the election results were revealed. He also appeared in a product advertisement for Jaguar, where he was blindfolded and then maneuvered a new Jaguar X-type through an obstacle course in front of a live audience. Bavli has performed at The Magic Castle in Hollywood, California, Carnegie Hall in New York, and Caesar's Palace in Las Vegas. In 2007, Bavli appeared on NBC's television show Phenomenon, where he performed a heart stopping demonstration, a Russian roulette demonstration using 8 jars of hydrochloric acid, and a spoon bending demonstration. In 2011, he appeared in Stan Lee's Superhumans, where he performed his telekinetic demonstration. He also appeared in television shows such as Sábado Gigante with Don Francisco, Patty Show aired on Estrella TV, Dan Shilon's Talk Show, and Korea TV show named "Magic Hole". In 1986, Bavli was given an award at the Tannen's Magic Camp competition in New York City. In 1988 and 1993, he was ranked first in the category Stage Performer of the Year, and in 1990, he was named magician/performer of the Decade (1980-1990) by the Israeli Society for Promoting the Art of Magic. In 2000, Guy was named as the best performer at the "National American Broadcast" in Las Vegas, while he was merited for the best show at the International Broadcasting Convention in Amsterdam, representing Dream Team Ltd. in a trade show. In 2007, he took fourth place in TV show Phenomenon. In 2013, he was awarded Dunninger Memorial Award for his distinguished professionalism in the performance of mentalism, given by Psychic Entertainers Association. The award was previously awarded to mentalists such as Derren Brown (2006), Uri Geller (2010) and Kreskin (2012). Bavli moved from Israel to the United States in 2002. He is married and has two children. ^ a b c d "Israel's new utensil-bender touts powers of the sixth sense | j. the Jewish news weekly of Northern California". Jweekly.com. 2005-01-07. Retrieved 2011-01-17. ^ a b c d Jicha, Tom (February 1, 2009). "Magic man - Heart-stopping MyNetwork series puts Davie illusionist on YouTube. That's some trick". South Florida Sun-Sentinel. Retrieved April 12, 2012. Although Bavli, 37, is well-known to television audiences in South America, Europe and his native Israel, American TV is the big room, where you roll out your best material. ^ a b c d e f "Phenomenon TV Show, Series - Contestant Bio - Actor Online Biography – NBC Official Site" (Press release). Nbc.com. 2010-07-19. Retrieved 2010-10-10. ^ a b c d Bowling, David. "Master of the mind". Miamilifemagazine.com. Retrieved 2012-04-15. ^ Randi, James (January 4, 2008). "A SIMPLIFIED ART". SWIFT January 4, 2008. James Randi Educational Foundation. Retrieved March 23, 2012. The state of the art of spoon-bending – so beautifully demonstrated by our buddy Banachek and by Israeli magician Guy Bavli, among others – has progressed far beyond what Uri Geller first showed the media back in the 1970s. ^ Admirable mind reader Guy Bavli predict election result of 1996 Before two weeks of result (Dailymotion). 24 February 2014. ^ "I Like to Watch - I Like to Watch". Salon.com. 2007-11-04. Retrieved 2011-01-17. After a few minutes, Guy's pulse slowed until he was slumping in his chair, and then there was a flat line on the heart monitor. ^ Kinetic Man. History Channel. 4 November 2011. ^ "Psychic Entertainers Association Awards". Psychic Entertainers Association. Retrieved 21 May 2014.